With the start of school right around the corner, it is the perfect time to start fresh – spiritually, mentally and physically. 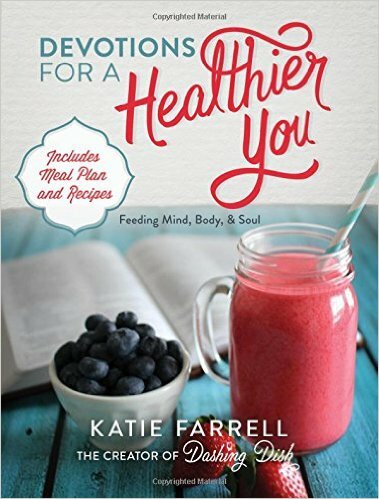 If you are like me and struggle with being healthy in any of those areas, then Katie Farrell’s book, Devotions for a Healthier You, is just what the doctor ordered. It contains 71 days of devotions. Each day there is a key verse, short devotional and prayer. These are great for anyone whose schedule is maxed out. It doesn’t take any time at all, but you enter you day filled with scripture and inspiration. Peppered throughout the 71 days, there are also dashes of inspiration and some yummy recipes, complete with mouth-watering pictures. Katie also includes four additional things to get you off on the right foot. Healthier You is filled with wonderful tips and suggestions without being overwhelming. Beautiful photographs round out this book, which is certain to be a reference on my bookshelf. I encourage you to pick a copy for yourself or a friend.